We’ve had a busy quarter since the last issue of The Source. Our monthly webinars continue to generate strong attendance so we’ll be bringing more of those to you over the coming months. Thank you to the thousands of you who have downloaded BCAction’s Think Before You Pink® Toolkit. Our hope with this toolkit is to put a tool for significant change into the hands of activists across the country so we can change the status quo in breast cancer one pinkwasher at a time. And finally, Komen’s decision to defund and then refund Planned Parenthood outraged us to action. We were inspired by the women’s health activists who demanded Komen put women’s health before corporate and political agendas. These demonstrations of individual activism means one thing: collectively we are creating change. Our monthly webinar series is a great way for people living anywhere in the United States (or even abroad!) to plug into the latest news and analysis and connect with other activists working for change. We co-hosted a webinar in November with staff from Environmental Working Group and the Campaign for Safe Cosmetics: Toxic Cosmetics: What Consumers Don’t Know About Their Beauty Products and What You Can Do About It. We took a hard look at the problems with our current cosmetics regulatory system, discussed who exactly is put at risk by toxins in cosmetics, and highlighted ways individuals can take action to change the current system that permits harmful chemicals into our personal care products. In January, the focus of our webinar was the IOM Report on Breast Cancer and the Environment, which was released during the San Antonio Breast Cancer Symposium in December. The webinar, A Briefing for Advocates: The IOM’s New Report on Breast Cancer and the Environment, was presented by BCAction’s Executive Director Karuna Jaggar and staff from the Silent Spring Institute. And finally, in February, Program Associate of Education & Mobilization Sahru Keiser, Think Before You Pink activist Robyn Steotzel and I hosted a webinar called Turning Knowledge Into Action: The Think Before You Pink® Toolkit. We walked attendees through all the various activist resources, educational tools, and campaign ideas in the toolkit. 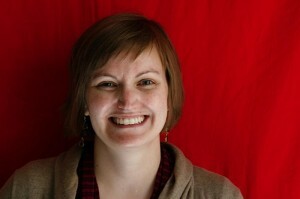 And Robyn took us through all the ways she has used the toolkit to create her own campaigns to end pinkwashing. If you’ve missed any of these or other previous webinars, you can find past topics, descriptions, and watch recordings here. And please, visit the same website page to sign up for future webinars, too. BCAction provides information about breast cancer to anyone who needs it. Contact our Resource Liaison, Zoe Christopher, at info@bcaction.org or call toll free at 877-2STOPBC with questions you have. In the past few months, Zoe has responded to questions about the quality of breast cancer treatment for incarcerated women, treatment options for elders, side effects of aromatase inhibitors, the IOM report on breast cancer and the environment, breast implants, and ductal carcinoma in situ (DCIS). Our new Think Before You Pink® Toolkit is proving to be a great resource for activists. The toolkit is divided into three sections: Learn offers you an insider’s look at pink ribbon marketing and the politics of breast cancer; Share provides you with a list of critical questions to ask about pink products and ways you can engage friends and loved ones when you are asked to sponsor them in a breast cancer walk or run; and the Act section contains specific ways to take action that will move us closer to really addressing and ending the breast cancer epidemic. Nearly 3,000 of you expressed your outrage when Susan G. Komen for the Cure allowed politics to come before women’s health when they decided to pull funding for Planned Parenthood’s vital healthcare services. The result of your advocacy and that of other women’s health activists? Komen restored the funding to Planned Parenthood. It was a victory, and showed us what is possible when we take action together. BCAction is a plaintiff in the lawsuit challenging Myriad Genetics’ patent on the “breast cancer genes,” BRCA1 and BRCA2. The latest news on this comes from our attorneys at the ACLU and the Public Patent Foundation, who petitioned the U.S. Supreme Court in December to hear our case. 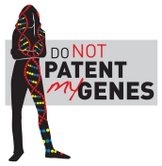 In early March, we attended a public hearing hosted by the U.S. Patent & Trademark Office and provided testimony about the harm gene patents do to women. You can submit your comments about gene patents and genetic testing directly to the U.S. Patent and Trademark Office so women’s health is not left out of the picture. We continue to closely monitor legislative regulations that will bring the broad systemic change that plays an important role in addressing and ending this epidemic. In December, we signed on in support of a number of pieces of legislation to that end, including Congressman Markey’s petition to the FDA to ban bisphenol A (or BPA, which is a synthetic estrogen used to harden polycarbonate plastics and epoxy resin) from infant formula and baby food packaging, canned food, and reusable food containers. In January, we opposed the FDA’s Draft Guidance for Industry and Food and Drug Administration Staff on the de novo classification process (which is a regulatory pathway for some low- to moderate-risk medical devices that are not comparable to a legally marketed device) because the process does not require proof of the safety or effectiveness standards for these devices, and thus doesn’t improve patient safety. In November, we signed on in support of a letter to members of the House Energy and Commerce Committee and the Senate Committee on Health, Education, Labor and Pensions urging them to support policy that would give the FDA authority to recall dangerous drugs, improve FDA inspections and oversight of high risk sites, so we can continue to improve consumer safety. We also supported the federal Safety of Untested and New Devices (SOUND) Act of 2012, aimed to protect people from avoidable harms caused by unsafe devices that should never have been cleared for sale in the first place. Your involvement is critical to the success of all of the efforts mentioned above. Sign up for BCAction e-alerts to learn about breaking breast cancer news, our advocacy efforts, and more. Join our monthly webinars. 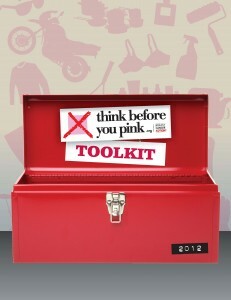 Download your copy of the Think Before You Pink Toolkit.